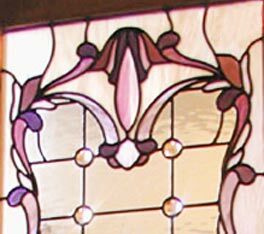 SANSABADOOR Victorian Style stained and leaded glass Custom Door Glass Design. "SANSABADOOR" VICTORIAN STYLE STAINED AND LEADED GLASS CUSTOM DOOR WINDOW SEPARATING A WALK-IN CLOSET AND BATHROOM. 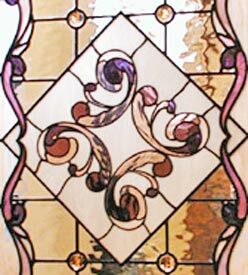 Stained and leaded glass door window created by Jack McCoy© for a private residence in San Saba, Texas.